The ViewBoard® IFP5550 is an 55” 4K (3840 x 2160) interactive flat panel display with an open platform design and excellent collaborative capabilities. ViewBoard®’s user experience is highlighted by its intuitive two-finger Floating Pen and exclusive one-touch to Google Drive/OneDrive Save features, which stand out above all else by placing the board’s controls at your fingertips. With open collaboration in mind, ViewBoard® is fit for integration into Google-based environments, offers seamless Windows compatibility, and comes equipped with Mac multi-touch gesture mirroring. Powered by optional Oktopus software, ViewBoard® IFP5550 supports .iwb and .notebook file formats and accesses to 10,000+ ready-to-use lessons on-line. 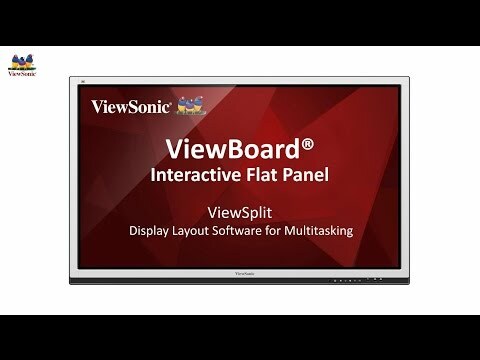 Pairing ViewBoard® IFP5550’s 20-point touch display with pre-installed tools, such as vBoard for annotation, ViewBoard® Cast for content sharing, and Zoom conference software, allows multiple users to remotely write, share, and interact simultaneously as if they were in the same room. With its built-in Quad Core processor and internal storage, ViewBoard® IFP5550’s computing capabilities are powerful enough to support an array of multimedia applications. The optional slot-in PC with Windows 10 OS offers users specialized annotation software ViewBoard 2.1 for more dynamic interactivity functions. Supporting DisplayPort 4K input, HDMI-out, as well as shared USB and LAN ports for the embedded player and optional PC makes it flexible enough to fit a wide range of user scenarios. Its versatile connectivity provides users with hassle-free connection to a multitude of devices and a VESA-compatible design allows for placement on a wall mount or trolley for flexible installation anywhere, no matter the occasion.